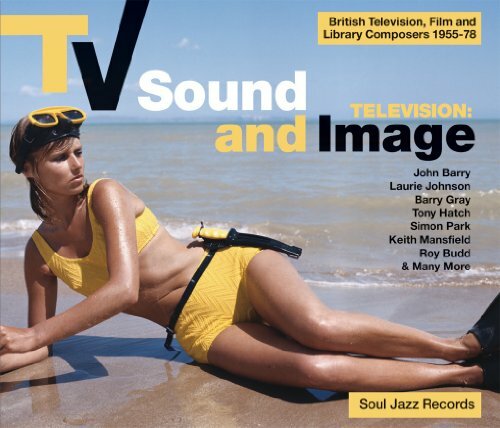 Soul Jazz Records presents a double vinyl LP compilation featuring British composers who worked in television, film and music libraries over the second half of the 20th century. This release is part two of Soul Jazz’s TV Sound & Image series. Aside from John Barry, the majority of composers featured here remain relatively unknown. And yet ironically they have created some of the most recognizable songs in British popular culture, their music widely disseminated on television. This album is not however a stroll through the TV memories of the mind, but an exploration of the serious contribution that these creative musicians have on the landscape of popular music in Britain. Most of the music featured here was commissioned by music libraries such as KPM, De Wolfe, Chappell, Bruton, Themes International, Peer International, Conroy and Amphonic. Perhaps the most interesting aspect of the music featured here is that despite library or commissioned music being on the one-hand the ultimate ‘faceless music’, with composers often uncredited, its widespread use in film and television makes it simultaneously some of the most recognizable in the world. A quick role call of these would include Neil Richardson (who composed the theme tune to Mastermind) and Barry Stoller (who wrote Match of the Day). The Simon Park Orchestra’s Eye Level, theme song to the BBC series Van der Valk, reached number one in 1973. CCS’s cover of Led Zeppelin’s Whole Lotta Love was the theme tune to Top of the Pops. And so on. The 36 track double LP vinyl soundtrack is a super-loud super-heavy gatefold sleeve limited edition release. Comes with a 50-page book featuring text, biographies and photography. Compiled by Stuart Baker (Soul Jazz Records) and sleeve notes biographies by Jonny Trunk (Trunk Records). Here then is a guide to the amazing music of many of the composers (both well-known and obscure) responsible for some of the most widely known music ever to come out of Britain in the second-half of the 20th century.